The hepatitis A total antibody test checks the HAV total antibody blood level. What is the hepatitis A total antibody test? The hepatitis A total antibody test measures the hepatitis A total antibody blood level. Why is the hepatitis A total antibody test important? The hepatitis A total antibody blood test helps check for hepatitis A immunity or a hep A infection. 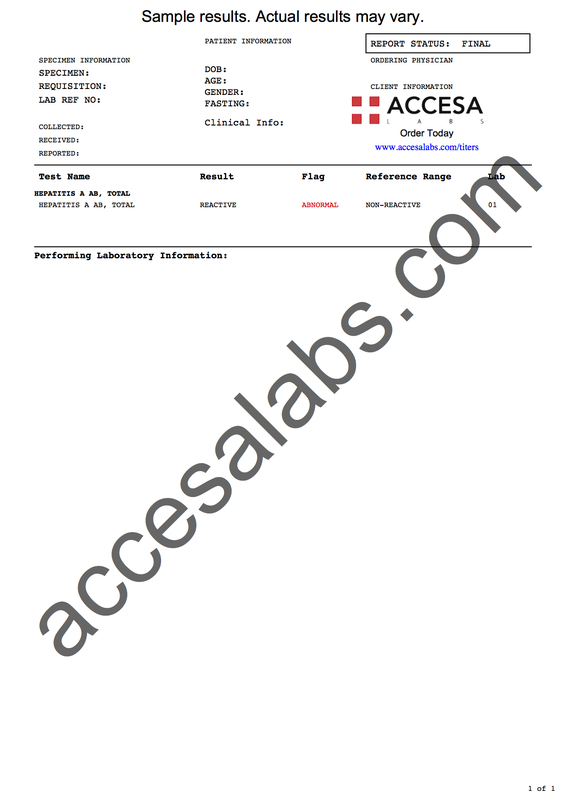 This Hepatitis A Total Antibody Test is a blood test. The hepatitis A total antibody test, also known as a HAV total antibody test and hep A total ab blood test, measures the hepatitis A total antibody blood level. Hepatitis A, or Hep A, total antibodies is a test that checks for a special class of proteins produced by the immune system known as immunoglobulins. Also known as a HAV total antibody test, this particular lab test checks for hepatitis A IgG antibodies and hepatitis A IgM antibodies in the blood. To understand whether the presence of hepatitis A antibodies indicate an infection or immunity from prior vaccination, the IgG and IgM antibodies are often ordered together through the commonly ordered hepatitis A test panel. To get a hepatitis A total antibody test near you, just order online and get tested at the selected Quest Diagnostics lab. Once the hep A total antibody lab results are ready, they will be available for download. As can be seen on the hep A total Ab lab report, the hepatitis A total antibody blood level will be reported as reactive if antibodies are detected in the blood by the lab. The hepatitis A total antibody blood test is often ordered with the polio titer and the Tdap titer. Hepatitis A Total Antibody Test at Guaranteed Prices.